and what links I've been posting on reddit (cos). Update: I abandoned delicious in 2016 after they'd been deterioriating for a few years, and I now post links on pinboard instead. Where are you? Fill out my LJ poll. Lots of talk in the past couple of days about former Starbucks CEO Howard Schultz saying that he may run for president in 2020 as a "centrist independent" - and a lot of it is calls for him not to screw up our chances of defeating Trump by running as an independent. Now, I agree that he is not an especially appealing candidate. If he doesn't run at all, I don't think we'll be missing anything. This rather snarky article summarizes it pretty well. But if he did run as an independent, I think he'd be much more likely to hurt Trump than to help him. When Trump got elected, he was very unpopular. He got a lot of votes from people who didn't like him - but also didn't like Clinton. That was a very large chunk of the vote, people who disliked both candidates, and Trump won that group by a large margnin, which is one of the things he depended on to be able to squeak by and get narrowly elected. We hear a lot about Trump's approval rating being in the 40s, and recently dipping into the high 30s in several polls due to the shutdown. But more importantly, disapproval of Trump (which is not just everyone who doesn't approve, since there are always some people who are neutral or undecided) has been above 50% for two years. It seems very very likely that Trump disapproval will stay above 50% through the rest of his term; to win, Trump will once again need to depend on people who disapprove of him choosing to vote for him. An independent candidate like Schultz, one who is portrayed as running as an independent primarily because he doesn't like Democrats proposing to raise taxes, is probably exactly the alternative that dissafected conservatives would go for. People who don't like Trump but are inclined to vote for him despite that, because they can't see themselves voting for a Democrat or don't like the Democratic candidate, are pretty much the only group I can see Schultz appealing to in any numbers. If he gets any significant number of votes, I bet it'd be mostly from them. When I posted this poll last week, I didn't realize I had default settings on my account that only allowed people with dreamwidth accounts to vote. I think I fixed that now? If you couldn't vote in it last week, try again and let me know? Are you on LiveJournal, Dreamwidth, or both? Nearly two years ago, I imported all of my LiveJournal posts to Dreamwidth and switched to posting there rather than on LJ. That was when the Russian owners of LiveJournal changed the rules to ban "political solicitation" and started cracking down on LGBTQ posters and critics of Russia, and a lot of people moved off LJ because of that. But I kept automatically crossposting my dreamwidth posts to LJ. Sometime later, I shifted to mostly just reading on dreamwidth, and stopped checking my livejournal friends page. I realized recently that some of the people I used to read haven't actually moved, and I hadn't noticed because to me it looked like they (you?) just stopped posting! But now I see that even though a few people are crossposting like I am, there are some people I read who are only posting on one site or the other, not both. That also leads me to wonder where people are reading. But I'm interested in your comments about your use of these sites, in addition to the poll. "+" if I've never spent the night there before 2018. Though that includes a few places I had been to or thorugh before, just not overnight. Looking to protect nature in the USA, or want to make some year-end charitable donations? Our National Parks need help! During this government shutdown, National Parks are keeping their gates open though visitor centers and other services are closed. Some park rangers are even working without pay, but the majority of staff are out and there's a risk of more damage to the parks as they remain open and unsupervised. National Park funding in general has been very weak in recent years, not only during the Trump administration but also the years of Republican congresses before that. Hire interns for the National Park. Fund trail repairs and facility maintenance. Organize cleanups and invasive species removal. Run activities for visitors, like guided walks. Fund research and conservation projects. I donate to Friends of Hawaii Volcanoes National Park and the South Florida National Parks Trust (supporting Everglades, Dry Tortugas, Biscayne, & Big Cypress). FHVNP is especially in need of funds now, after several months of more active eruptions and daily earthquakes in the first half of 2018 wrecked a lot of park trails and facilities that the National Park Service is not going to have the money to repair and reopen. And South Florida is one of the most ecologically interesting and sensitive areas in North America, under threat due to large cities and lots of industry. You can donate to those two, or search for the nonprofit partners of some of your favorite National Parks, or ones that you know need protection. And tell me about some of them! If I had been able to arrange my life such that I could spend some time in Boston in July & August, I probably would've found a couple of days to go volunteer for Nika Elugardo. She's in a Democratic primary against incumbent Massachusetts state rep Jeffrey Sanchez, in the 15th Suffolk District, which goes from JP to Mission Hill with a chunk of Brookline south of Route 9. I see here not only an excellent candidate, but also an opportunity to nudge the whole state legislature. We have this long-running problem in Massachusetts where the House, despite its large Democratic majority, repeatedly punts on important legislation or pares back necessary reforms. While we have quite a few wonderful progressive House members, they're a minority, and House leadership has often either been conservative or, for whatever reason, seemed to try to avoid embarassing situations for Republicans (especially Republican Governors) by protecting them from having to vote on or veto legislation they don't like. The MA Senate added several important protections for immigrants to the state budget, by a large majority. We really need this now! But the House wouldn't even bring those measures to a vote, so the House version of the budget didn't have them. As chair of Ways & Means Committee, Sanchez was one of the leaders of the conference committee to work out the final budget from the House and Senate versions - and the immigrant protections weren't there. He said there was no "consensus", but we're pretty sure there was a very solid majority for these provisions in the House, just as in the Senate (if only there had been a vote, maybe we'd know!). Baker clearly didn't like it, and maybe some conservative Democrats in the House didn't either, and because of Sanchez and speaker DeLeo, they were saved from having to actually take a stand one way or the other. Baker's shiny image would've been tarnished if he vetoed the budget over his objections to protecting immigrants, but signing it might have hurt him with his base, so Baker I'm sure is happy to be able to evade that. But now we have another year without these protections. State law gives state employees the right to collective bargaining, but due to a technicality, public defenders aren't considered covered by that definition, even though they are paid by the state. So they can't unionize. They're severely underpaid, their case loads are too high, and there's lots of attrition. A very simply and straightforward bill to clarify that they have the same right to unionize as anyone else who works for the state, just sat in Ways & Means for the entire session. Despite a flurry of phone calls (including a few from me) in the final week, when many bills get reported out of committee, this one was stuck there and never got a vote. When I spoke to someone at Nika Elugardo's campaign, they were already very familiar with and knowledgeable about both of these issues, and others. She's been talking about them on the campaign trail. If she can beat Sanchez in an upset, his failure to get important legislation through his committee, and the whole general habit of House leadership of dropping progressive legislation on the floor to protect conservatives and Republicans from embarassment, will be highlighted. Other legislators will see that this endangers their seats, even if they're powerful and supposedly safe for re-election like Sanchez. Take a look at Nika Elugardo's policy section. She advocates for ranked choice voting, important criminal justice reforms, single payer health care, protections for immigrants, and investing in the T - another thing the state House has hobbled over the years, even when we had a governor (Deval Patrick) who really tried. Unlike Sanchez, she really seems like she will work for the things she's talking about. Are you in Boston? Maybe you can find a half day between now and Tuesday to volunteer for Nika! An ACLU report revealed many cases of abuse of children who had arrived at the border unacompannied - including threats, denial of medical care, and physical violence. This is not new; the ACLU report is based on document from 2014 and earlier. What's new is that they just published the report, after taking a while to get the documents from the government in the first place, then read and analyze them all. One of the things they stress in the report is a "culture of impunity" in Customs and Border Patrol (CBP), meaning these abuses will continue. The Trump administration has a new policy of forcibly separating families who arrive at the border together, something they had been doing sporadically for a while and are now doing systematically. Even very young children are forcibly taken from their parents and imprisoned separately. A story about 1475 "missing" children. However, most of them, maybe all, are probably not actually "missing". These are children who arrived at the border unaccompanied, in the past. They were transferred to the Office of Refugee Resettlement (ORR - a part of the Dept of Health and Human Services), whose job was to find sponsors for them to live with, often while waiting for their immigration cases to be processed. ORR tries to find a relative living in the US to place them with, but when no relative can be found, they may place kids in temporary shelters. ORR did a cursory survey of about 7500 kids that had been placed with sponsors or shelters in recent years, and did not get responses or accurate up to date information about 1475 of them. Most or all of those kids are probably living with relatives, and many may not want to be contacted or found by the government. Hearing about all of these all at once led to a lot of confusion, which could misdirect anger in unproductive directions, when there's a lot of reason for anger. One understandable and common misunderstanding was "they're taking children away from their parents and losing track of them and placing some of them with traffickers!" Nobody has reported such a thing happening. Also, the "missing" children aren't a problem, per se. It used to be that ORR was explicitly told *not* to cooperate with immigration enforcement, to make it easier for them to find relatives to place children with - relatives who may be scared of dealing with immigration. But the Trump administration has changed that, so that now, if ORR can find these children, it may deport some of them, or deport their sponsors, or someone else living with them. Many of them now have very good reason not to want to be found. So the fact that ORR's very low-effort survey ended up with "we don't know" for 1475 kids doesn't mean much. Children and parents are being forcibly separated at the border! Abuses like the ones that happened until 2014, are likely still happening. Thase are the things to organize about now! Begin by calling both of your Senators and your US Representative ASAP. Pick one of the above for your call. Either tell them it's immoral and inexcusable to forcibly separate families at the border, and they should demand the CBP stop doing that, or tell them you're horrified at the stories of abuse of unaccompanied children by the CBP and they need to put in place effective policies to prevent it. The next day, call them all again, but this time about the issue you didn't call about the first time. Next, find people you know in other states and districts - especially ones represented by Republicans, who need the most convincing and are the ones most in a position to do something about this - and urge them to call. One by one, text or email or call your friends and ask them to call. Plan to attend a March for Stolen Children on June 14th. We're going to the airport. Unlike in Boston, the trip to the airport in Seattle is long and annoying with public transit, so if we have large bags we drive or take a cab. Maybe we could try Lyft this time? I open the App store on my iPad and search for Lyft. Uber app pops up as first hit; no Lyft app. Oh, maybe they only have an iPhone app, and the app store is stupid... I change preferences to look for iPhone apps, and there it is. I install it. Open up the Lyft app, and it asks me to enter my phone number, which it will verify with a text message. I enter the number of my Android phone and it just does nothing. Maybe this is one of those ridiculous apps that verifies by sending itself a text and checking for it automatically, which of course can't work on iPad because you can't SMS an iPad? But it has a "log in with Facebook" option, worth a try. Try logging in with Facebook. It complains that there's no Lyft account associated with this Facebook account, so I need to create one first, using a phone number. I'm not going to use an app that can't be used on my iPad at all, but maybe I can register on my Android phone and then log in to the same account on the iPad? I find the Lyft app for Android and install it on my Android phone. Open up Lyft on Android, again the prompt for a phone number, but this time it suggests a number! Without looking, I say yes, and nothing happens. I try again, nothing happens. Then I realize - wait, this is not this phone's number! This is the phone number of my old Treo phone! Okay, so I reject the suggested number, and now it prompts me to enter one. I enter my Android's phone number. It turns red and the app complains, "please enter a valid phone number". I double-check the number, it's correct. Try again, same thing. We call a taxi company, and they take us to the airport. P.S. Does anyone know of a decent app-based taxi/rideshare service we could use in Seattle? In Boston, we use fasten, but they're not in Seattle. Uber has been too loathsome a company, I'd feel too icky using them. Lyft's app is crap. Anything else we could try? Hipsters are said to like things before they were cool. Now that everyone knows about the thing, to the hipster it's no longer cool. We're looking for a word for someone who's on the other side of that. They get into things that were cool, but whose cool-time has passed. Now people think "what, someone's still into that?" ... and that's when this person gets into it in the first place. Suggest a good word for that? One of those posts that's more for me than for anyone else; I wanted to get this all written down while it's still clear in my memory. Also, a place to point people to if they want to know how Jessie cat's last week went. This is Jessie Cat. 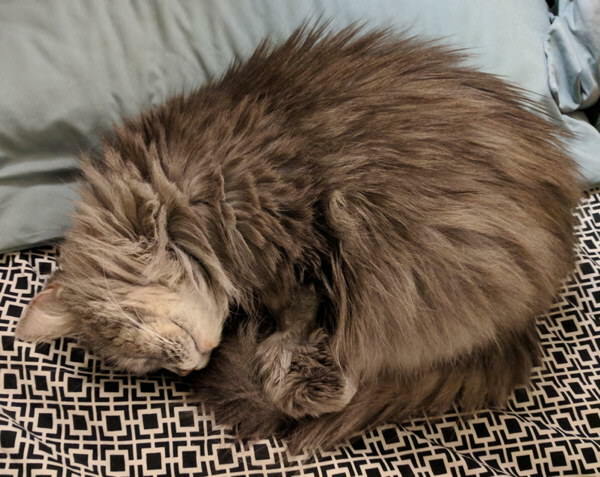 She finally succumbed to the FIV she's had since my then-housemate and I first found her on our back porch in late 2007. She was the nicest sweetest cat and I'll write more about her later. For now, here she is sleeping sweetly earlier this week. More scientists in Congress next time? Almost ten years ago I posted about scientists in Congress - at the time, there were four. I posted again four years ago, when Rush Holt was running for US Senate. His leaving Congress brought the number of scientists down to just one the following year. Originally starting from just curiosity, I was dismayed by how few there were! I knew there weren't enough, since it was already showing quite obviously by 2007 that Congress did not have enough scientific perspective, but I though out of the 535 there would be, maybe, 15-20 scientists. In fact I don't think we've had more than 5 at the same time in decades. Maybe the next Congress will change that? Donald Trump's War on Scientists Has Had One Big Side Effect: More than a dozen Democratic candidates with scientific backgrounds are running for Congress. This article conflates "scientists" with a broader range of STEM fields. We actually already have a few engineers in Congress, and this article includes engineers, as well as doctors (of which we have even more - but many of them clearly don't have a scientific outlook). But even if you discount those, there are more people with a science background running than anytime I'm aware of, at least in decades. Let's keep an eye on this and see how it turns out in 2018. P.S. The only scientist I'm aware of in Congress currently is Bill Foster, the same one who was first running for the office when I posted ten years ago. Are there any others you know of? Presents itself as a credit card (compatible with holds, car rentals, etc.) but acts like a debit card, drawing money from its own account. If there's no money in that account, it fails to work. No bills to pay. Easy scheduled transfers to or from any of my regular bank accounts. Remotely instantly disable or re-enable the card, at my whim. Clear transaction log that shows all transactions, even from a minute ago, and gives the time of each transaction, not just the date. On mobile, instant notifications for every transaction. I have a card from simple.com that does all of that, but I'm looking for other alternatives. I've called a few banks (like Capital One) and haven't found anything else that does all of these. Do you know of any? Four photos from a very old folder. Based on the date, I'm fairly sure I took them on the flight home to Boston from attending Minicon in Minneapolis with silentmachine. But I can't find any record of that flight so I don't know what stopover city I might've gone through. Click on the image to see all four photos; do you recognize those bridges? 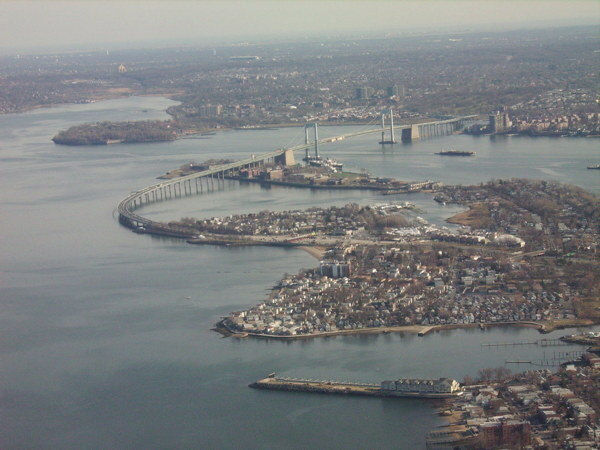 Edit: Commenters have identified the first bridge as the Throgs Neck Bridge and the second one as the Verazzano Narrows Bridge (both in NYC). are, even though I probably know them. dreamwidth usernames I don't know or remember. I haven't been reading dreamwidth nearly as much as I used to read livejournal, because I find the default reading page really hard to read, and it kind of repels me. Due to the unpleasant experience, I just don't visit as often. But I haven't had time to try to figure out how to fix it, and the few FAQs and settings I found were either confusing or just didn't seem to address the issue. Clear separation between different entries, in the form of a wide colored divider bar across the page. On LJ that bar was also where the title of the next post would be, but I don't need that specifically; just a clear visual separation between posts. I could pick a unique combination of foreground and background color for each person. The post itself didn't appear in that combo, but the post was outlined by the background color, and the post title and person's username would appear in the foreground color I chose. This let me easily "recognize" whose post I was looking at by color. Is there any way to make my reading page on dreamwidth like that? What do I need to do? I've stuck with LiveJournal all these years largely because that's where more of the people I know and read still were. But the new Russian terms of service are driving so many to Dreamwidth that the balance has shifted. And the new Russian terms of service... they say political advocacy is prohibited. That's more than 1/4 of my posts. I have a feeling they really only care about getting Russian activist bloggers and won't bug the English language livejournals, but who knows; my account risks getting deleted or locked for violating the new terms. So I've imported all of my old posts to cos.dreamwidth.org and set up automatic crossposting to LiveJournal. I'm going to post there from now on, and hope you'll follow me there if you read me on LJ. If your DW username doesn't match your LJ username, comment on this entry using your LJ account telling me what your DW username is.